13" wide. Saying reads "Love me tender, love me true, never let me go. "You can also get this personalized, maybe their names and date. "Love me tender, love me true, never let me go." 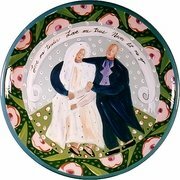 Beautifully said on this impressive platter, as wall art or a center piece.